TGIF and all that - Stop staring and start sewing! Okey dokey, the winner of the cute little Michael Miller charm pack is Emily who left her comment at 5:24 pm. Woohoo Emily! Email me! Here are the rest of my pictures from Quilt Market. The place was just oozing with creativity and originality. 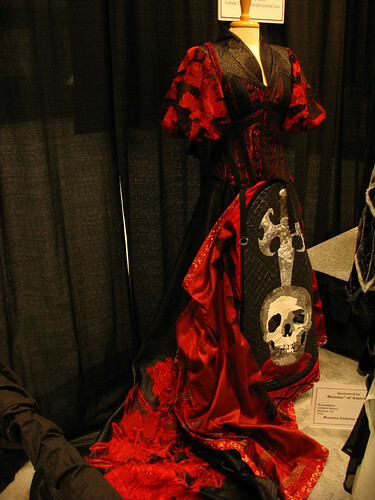 Check out this amazing dress. It must be from a Shakespeare play (tragedy, I'm guessing). The detail and drama of it just captured my attention. Wow. 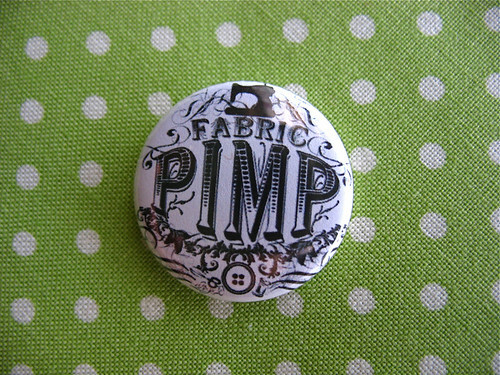 And here is the super fun button designed by Traci (cute site!) for Myrinda (great Euro fabrics!). Myrinda was generously handing this out to other store owners (and designers! Check out Joel Dewberry on her blog!) and also had a t-shirt with this design on it. It was hilarious and brilliant (and original!). I met Tina Given's (while wearing a shirt made from her fabric!) and she was so sweet and her new line is so beautiful I can't wait to get it in my store. I'm sorry I didn't get any pictures but if you check out the Quilt Market 2008 photostream on flickr I know you'll see some of her amazing booth. Anyway, do you want to know what today's give-away is? Well last year around this time I had the pleasure of working with the Bailey's while they were working hard to get their amazing, original (Heather thought these up), patented hair accessory ready for launching. Working with them were some of their friends who had access to all the materials, manufacturers, contacts, etc. Curiously a few months after the friends moved away they launched this website. Hmmmmm......with friends like these...? You know the rest. So in honor of true originality (and decency) today's give away is this cute set of TRASH TIES and 2 YARDS of Freshcut fabric (the winner can pick from my store!). You can have 2 cuts of 1 yard each or even 4 cuts 1/2 yard each. How fun is that??!! 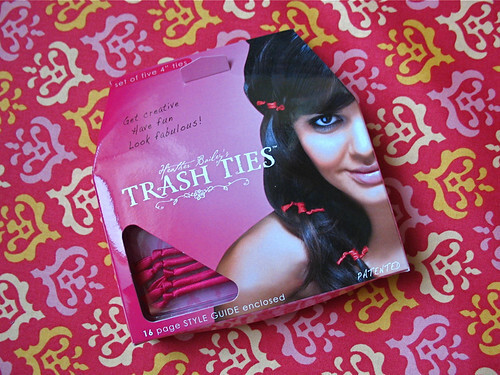 Just leave a nice comment and be sure to get yourself some fun and amazing Trash Ties (if you don't win these)! !